Our Journey of Hope’s Phoenix trainings and support are sponsored by Cancer Treatment Centers of America® at Western Regional Medical Center. As the Chaplain at Cancer Treatment Centers of America® (CTCA) in Goodyear Rev. 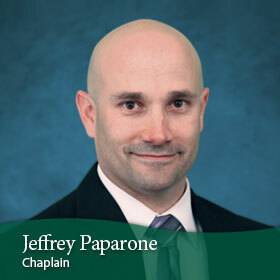 Jeffrey Paparone says, "I believe one's faith not only aids in the healing process, but at times faith can actually heal one's disease," says Rev. Paparone. "At the very least, patients with faith seem to cope better with the diagnosis and prognosis of their disease, treatment and rehabilitation." Community outreach events will be announced here as scheduled. Cancer Treatment Centers of America treats many types of cancers. We listen to you, answer your questions and encourage you to be a part of the treatment decisions. Call an Oncology Information Specialist at the number below, anytime - day or night, to discuss second opinion appointments or treatment options available at CTCA.